Note: This post is part of the geoscience blog carnival, The Accretionary Wedge #13: Geology in Spaaaace!, hosted by goodSchist this month. Actually, I guess this is more geology from space. I’m cheating just a little bit because I’ve posted about these images before … but it was a year and a half ago and they are that cool that it’s worth doing again. The images below are from a 2003 Science paper by Malin et al. detailing fascinating landforms on the surface of Mars. You can also see these and more images on the Mars Global Surveyor site here. High-resolution mapping of planet surfaces (including Earth) from orbiting spacecraft is revealing the beauty and complexity of erosional and depositional landforms. The better resolution (in some cases sub-meter) allows researchers to gain a more comprehensive appreciation of the scales of features. Images from space provide the large-scale context while also revealing intricate details. These particular images are from what are interpreted to be ancient river and delta deposits exposed on the surface of Mars. This area is known as the Eberswalde Delta (contained within the crater of the same name). In the image above note the branching and spreading out of the curvilinear features from left to right. This is called a distributive pattern and is an important criterion for recognizing sediment deltas and fans (alluvial, submarine). 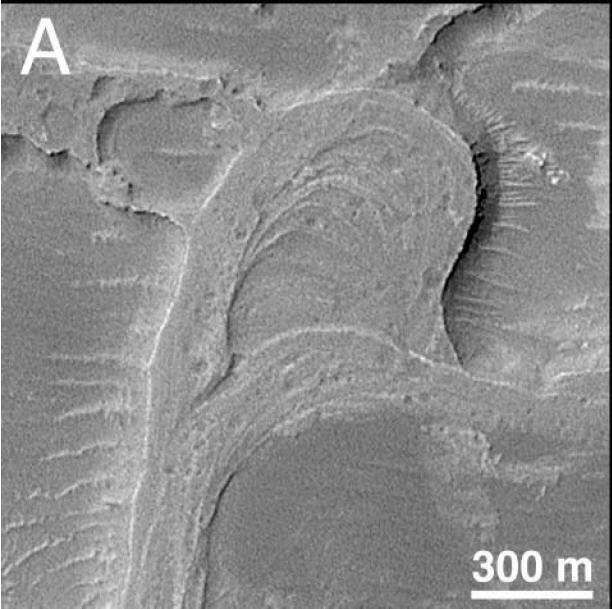 Besides the fact that rivers and deltas are awesome and here are some examples from another planet … these particular exposures are unique in that they are revealed in inverted topography. That is, the channel deposits (which presumably have coarser-grained material in them) were more resistant to subsequent erosion so now they are positive topographic features (ridges, mesas, plateaus). Note the criss-crossing of the channel features in the image above. The image above is my favorite. Take a look. See it? 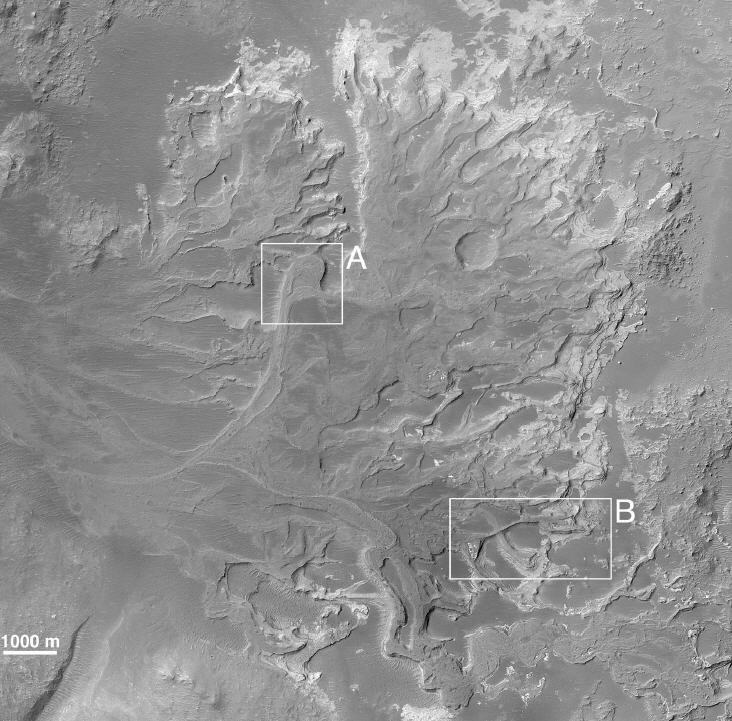 Yes … an ancient meander loop on Mars! How cool is that?! 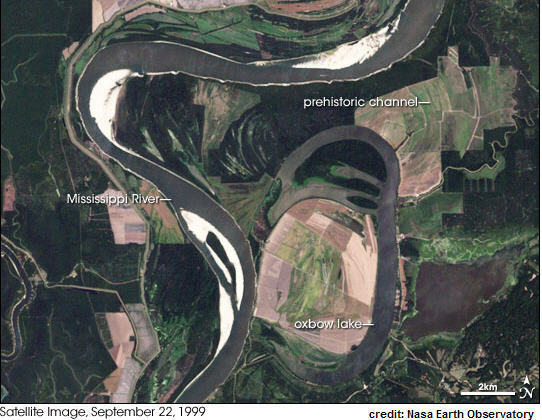 Compare to this nice image of Mississippi River meander loops here on Earth. While these are certainly different scales, the form and patterns are very similar. If you looked around on GoogleEarth, I’m sure you could find a nearly identical analog (if you do, let me know in the comments). Now, the next step is to go ground-truth those Mars features … I would love to be able to walk around and check out the vertical cross-sectional view of those inverted channel-fills. These are great! Inverted topography – I love it. Glad you re-posted!